A client was very concerned by the behaviour of a wild rabbit that she had found. It was apparent that there was a problem with it's eyes which were swollen and clearly affecting it's vision. Consequently, she brought the rabbit to our surgery to see Agnieszka our resident rabbit expert. Very quickly Agnieszka was able to diagnose myxomatosis, a very common, highly contagious and fatal viral disease affecting rabbits. As the summer progresses we are likely to see many more cases brought in to the practice. Unfortunately, our only option is euthanasia. With a relatively mild winter larger numbers of wild rabbits survive into the spring to reproduce resulting in much bigger populations. This, in combination with hot summers and increasing numbers of biting insects, results in a huge outbreaks of disease and affected rabbits. Ultimately, this poses a direct threat to pet rabbits unless they have been vaccinated against this disease. 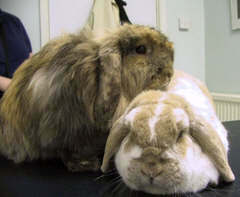 Fortunately for the clients own rabbits, "George" and "The Brown One", they receive regular vaccinations to avoid the debilitating and deadly symptoms associated with this condition. With the current debate on the dangers of spreading swine flu it is worth noting that successful vaccination remains the key to success against these highly contagious viral diseases.